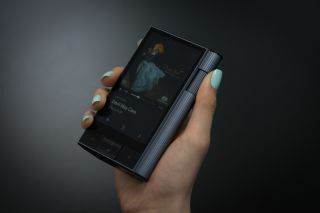 Astell & Kern Kann is a hi-res audio player with aptX Bluetooth | What Hi-Fi? The Astell & Kern Kann packs a DAC and a built-in amp, has 14 hours of battery life and a whole range of memory card slots. Astell & Kern makes some of our favourite portable music players, so we're always excited when the company launches a new one. Its latest, the Kann, is quite literally big news - with a depth of 25.6mm and weighing just under 300g, it's a hefty unit. It has a stylish design and ridged metallic back, and boasts enough features to qualify as an audiophile's dream. The Kann has its own DAC and a built-in amp with a normal/high gain switch. A&K says this means it will drive even the most demanding headphones with ease. It also boasts the lowest impedence of any of the firm's portable hi-res audio players. It supports PCM audio files up to 32-bit/384kHz, and DSD files up to DSD256 (11.2mHz). The Kann has plenty of connections too. As well as a USB Type-C port for faster charging and data transfers, and a microUSB, it has slots for both microSD cards up to 256GB and full-sized SD cards up to 512GB. And that's on top of the 64GB internal storage. Bluetooth aptX comes as standard, for wirelessly beaming tunes to a speaker. On top of all this sits a 6,200mAh battery - twice what you'd get in a high-end smartphone. That should translate to 14 hours of music listening before needing a recharge. The Kann is available to pre-order now, priced £900. The Astro Silver model will be available late April/early May, followed by the Eos Blue in late May.